The Greek government has suspended all football in the country indefinitely after violent brawls at a match between Olympiakos and Panathinaikos. The news also comes after club officials from the two teams clashed on Tuesday. Whilst the move may sound particularly extreme and unprecedented, this is, in fact, the third time this season that the league will be suspended. Newly-elected Greek party Syria have vowed to stamp out violence in the country’s football leagues and following these incidents have suspended football in all three Greek divisions of football. “What we have been informed is that the Super League and the Football League have been suspended indefinitely,” said Super League president Giorgos Borovilos, reports BBC. 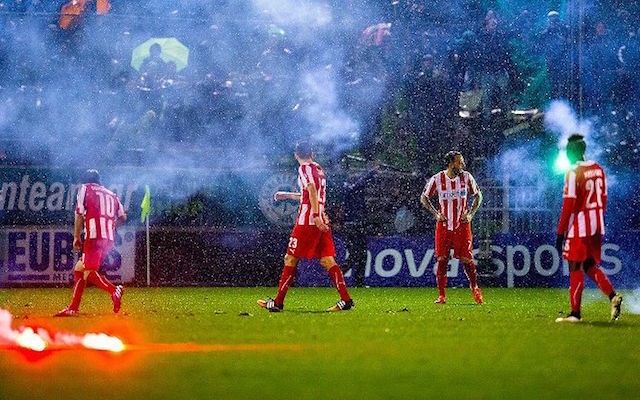 The match at the weekend ended 2-1 to Panathinaikos but was marred by fans throwing rocks, flares and bottles at match officials. A Panathinaikos official then claimed on Sunday in an executive meeting of Greek Super League officials that he had been punched by a member of the Olympiakos security detail.